Emblem of Quwat al-Jalil. On the top is a quotation from Qur'an 22:39, a classic verse used to invoke the concept of defensive jihad: "Permission [to fight] has been granted to those who are being fought because they have been wronged. And indeed God is capable of granting them victory." Beneath it is the name of Quwat al-Jalil's political wing: "Movement of the Youth of the Palestinian Return." 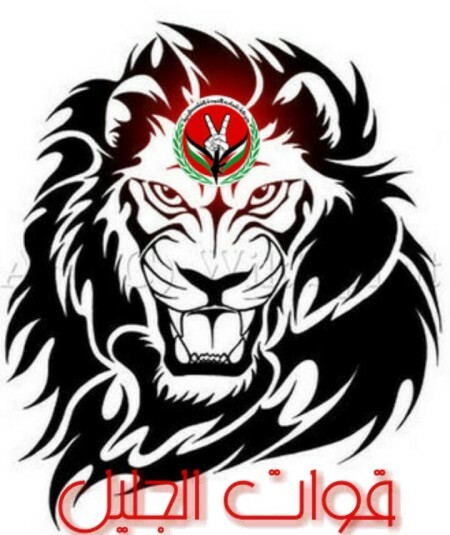 On bottom: "Quwat al-Jalil" (al-Jalil forces). He adds: 'Our resistance also extends within the lands of the Lebanese and Palestinian resistance, and we had the honour of launching the first rocket inside Gaza, named "Golan and Return," in 2012. And we are honoured that our arms are the arms of the Syrian army, for were it not for the Syrian state, there would be no basis for the Palestinian resistance...Israel is trying to destroy Lebanon and Palestine whereas Syria protects and builds them.'" The activism of Quwat al-Jalil's political wing, at least in the online realm, can be traced further back. As the article translated above makes clear, Harakat Shabab al-Oudat al-Falastinia was established back in 2011 as the protests in Syria was kicking off. In a manifesto released on 3 September 2011, published from Damascus and entitled "Statement of the pledge of sacrifice for the blood of the martyrs," the movement outlined its ideology in 17 clauses, typical of traditional Palestinian and Arab nationalist discourse, rejecting notions of any compromise with Israel. For example, the first clause affirms: "Palestine is the homeland of the Palestinian Arab people and is an inseparable part of the greater Arab homeland, and the Palestinian people are a part of the Arab Ummah." The fifth clause asserts that "the Palestinians are among the Arab citizens who had a permanent establishment in Palestine until 1947. Regardless of whether one was expelled from it or remained in it, everyone also who was born to a Palestinian father after this date inside or outside Palestine is a Palestinian." The ninth clause affirms that "armed struggle is the only way to liberate Palestine and it is therefore a strategy and not a tactic, and the Palestinian Arab people emphasizes its absolute resolution and firm determination to pursue armed struggle and move forward towards the popular armed revolution to liberate their homeland and return to it." Notably, the manifesto makes no mention of the unrest in Syria at the time, probably because the armed insurgency against the regime was still only in the nascent stages at this point. However, moving into 2012, Fadi al-Mellah began to speak openly of the events in Syria, characterizing the rebellion in an interview with the National Union of Syrian Students as "the diabolical conspiracy to which Syria is being exposed," while emphasizing that "the path of our return [to Palestine] begins from Damascus of the Umayyads." He also claimed that the supposed conspiracy against Syria had "begun to decline before the steadfastness of the Syrian Arab people" while affirming ostensible support for the right of Syrians to choose to embark on a reform project (i.e. some kind of limited reform within the regime's framework), giving rise to a "renewed Syria" that would "remain a fortress for the resistance and a rock to defend the Arab rights and causes." It was also in 2012 that Quwat al-Jalil began military operations on the ground, according to Fadi al-Mellah, who spoke to this author in a brief interview. Fadi al-Mellah also asserted to this author that his militia has operated throughout all of Syria. From the information it has openly publicised this year, Quwat al-Jalil claims to have operated on a variety of specific military fronts. On 2 July 2015, it was announced that Fadi al-Mellah had appointed one Fadi Sheibani as the official responsible for organization, "in guiding the resisters to support the coastal front [Latakia province], and mid-northern front [Hama-Idlib]." The post added that "today by God's help resisters have been sent to the hot zones in Idlib, Jisr al-Shughur, Jurin [in the Sahl al-Ghab], the coastal areas, and Jazal in the Palmyra countryside." In a later post on 16 September 2015, the group claimed participation in capturing the Abu Zayd hill overlooking the suburb of Dahiyet al-Assad in the Damascus area. On 16 November 2015, Fadi al-Mellah reportedly inspected the ranks of fighters in the Douma farms in Damascus countryside. In total, Fadi al-Mellah claimed to this author that his group has some 14 'martyrs' (fallen fighters). * Of this number, most have been openly publicised in announcements. 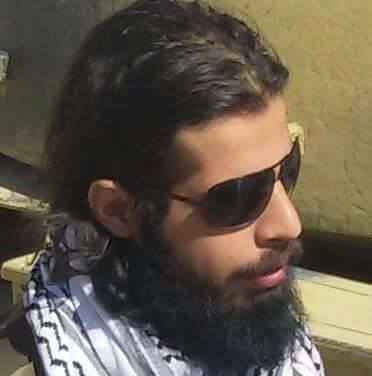 For example, on 23 October 2015, the group announced the death of one Muhannad Abd al-Aziz in Tel al-Karum in Quneitra province. On 11 November 2015, Quwat al-Jalil said that one Abd al-Majeed Mohsen al-Muhammad was killed in Deir az-Zor military airport. Further, on 23 September 2015, Quwat al-Jalil presented a list of 11 'martyrs' who had fought in "the eastern region of the Syrian Arab Republic" (most likely referring to Deir az-Zor province). All these 'martyrs' apparently have the army rank of al-mulazim sharf, perhaps pointing to some overlap with the Syrian army. *(Update 15 April 2016: to be precise, 3 'official martyrs' and 11 killed in a massacre in Deir az-Zor, as clarified by Fadi al-Mellah to this author in a subsequent conversation. A more recent campaign involved participation in the recapture of Palmyra from IS).